The world has lost another earth angel and I’m so honoured to have met you and got to spend time as a companion and friend. Maridan's Menagerie provided this guy with everything he needed after being rescued from his enslavement. Thank you Mari and Dan, sending you both love. It is with great sorrow that today we say goodby to our dearly beloved Greyhound, Rory. For those of you who don't know Rory's story, his first few year were filled with suffering and torment. Born into the racing industry, he literally had to run for his life. As is all too common when animals are exploited for profit, Rory's welfare placed second to greed. He was beaten, abused and neglected. Rory's trauma ran so deep that when we rescued him we couldn't raise our hands above our waists without him cowering out of fear that they would come crashing down upon him. At just over two years old Rory was retired from racing. He was not winning enough races for his owners to turn a large enough profit. 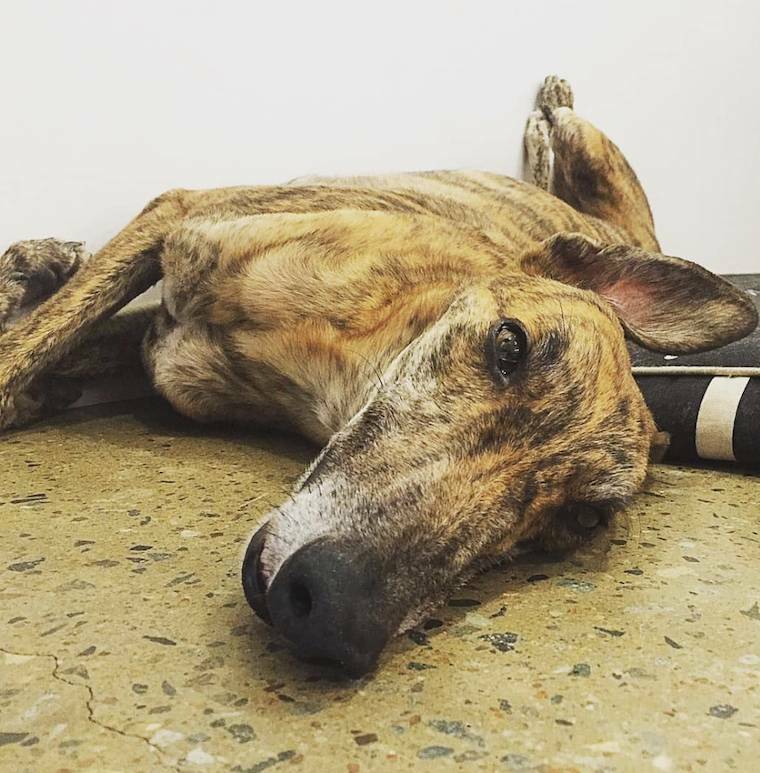 Like most retired greyhounds, Rory was facing certain death. His past trauma meant he was unlikely to be suitable for the restricted greyhound adoption programs that exist. Thankfully we were made aware of Rory's plight and offered him sanctuary. Following months of socialisation and training Rory emerged as a fun-loving mad-man, full of unconditional love and affection. Since Rory's rescue we notice a small growth on the side of his ribs. Given his history, vets thought it was likely calcification resulting from blunt force trauma. It wasn't until late last year that the lump started to grow. A biopsy showed that Rory had developed an aggressive form of bone cancer. Sadly there were no treatment options, and the best we could do was to make his remaining months as comfortable and fun filled as possible. That is exactly what we did. He enjoyed long walks on the beach, extra treats, and loved ripping up the yard with Stevie (our rescued cattle dog). Devastatingly Rory's cancer continued to grow and with it a rapid decline in his health. Today the heart-wrenching call was made and Rory crossed the Rainbow Bridge in the comfort of his home.